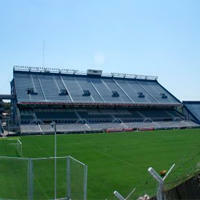 One day after last game at Estadio José Amalfitani stadium staff found the body of Diego Bogado, local hooligan. Cause of death is unknown, according to Buenos Aires Herald. Diego Bogado was a 36-year-old member of „Gang of Liniers” hooligan group (Liniers is the district of Velez Sarsfield in Buenos Aires). He was a notable figure among fans of Velez, with players giving him jerseys, etc. Could that be contributory to his death? Police refuse to draw too many conclusions at this time. The body of Bogado was found on Wednesday under the lower section stands at Amalfitani. He had both his cell phone (his wife claims it was broken, so she could not reach him) and wallet on him. Both objects are now analysed for potential clues. The 36yo left home on Tuesday for the game and never returned. His club distanced itself from whatever happened to him while at the stadium.